While trawling the news groups I noticed this adaptation of Stephen King’s The Mist was available for download. I haven’t read the story but from past adaptations of King’s work I wasn’t expecting much. I thought it might be decent enough to pass a few hours. However I was pleasantly surprised and shocked by this film. The story is fairly simple, a small town in Maine (like most of King’s work) is hit one night by a violent electrical storm, the following day the townsfolk are all shopping for supplies in the local store when suddenly emergency sirens start going off and a fast moving military convey race through the town. Suddenly a man with a blooded face runs down the street shouting warnings “There’s something in the mist! It took John Lee!” quickly followed by an otherworldly mist which comes rolling in and surrounds the building which is then shaken by an earthquake. There are indeed hellish monsters hiding in the mist, a giant octopus-like tentacle attacks a grocery clerk, a flock of prehistoric-looking insects invade the store and spidery creatures menace a group as they venture out to get medicine for an ailing man. What follows is a Lord of the Flies type story as the besieged townsfolk hole up in the store. Fear start to drive some of them half-mad. It doesn’t take long for most of the shoppers, egged on by the eccentric and spiritually messed-up Mrs. Carmody, to begin eyeing their fellow survivors as possible human sacrifices believing that the monsters have they come to exact God’s bloodthirsty revenge as a sign of the End of Days. However following the revelations of some trapped servicemen it is soon apparent that the cause is likely to be the local military base which may have been conducting experiments which could have opened a doorway to another dimension. 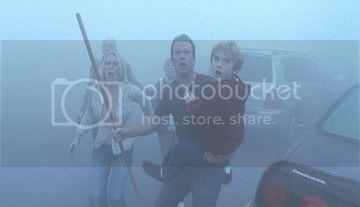 Like the great disaster films of the 1970s The Mist’s narrative tension (and horror) comes as much from the characters’ interactions as from the monsters the mist occasionally spits out. It has a terrific cast and decent enough special effects that do not upstage the human characters. The Mist mixes the imaginary fears of the HP Lovecraft inspired monsters and supernatural hints with our real fears: unchecked military or scientific activity, the breakdown of society, the end of the world. This entry was posted in film review, stephen king, the mist. Bookmark the permalink.